Stars of the Premier League past and present united to pay tribute to Frank Lampard as the three-time title-winner was inducted into the Legends of Football Hall of Fame. Lampard joined illustrious names in the Hall of Fame such as Sir Stanley Matthews, Pele, Sir Alex Ferguson and last year’s recipient Steven Gerrard at the event on Monday evening, which raised funds for the Nordoff Robbins music therapy charity. "Frank was not just one of my best players ever, but was one of the best professionals," Jose Mourinho said in a video message of a player with whom he won two Premier League titles at Chelsea. His captain at Chelsea, John Terry, said Lampard was a shining example to others. "Any young player striving to be at the top should look no further than Frank Lampard," Terry said. Lampard, who is fourth in the all-time Premier League scoring charts with 177 goals, said he never anticipated having such a glittering career, which he put down to one thing. "Work, work, work," said the 40-year-old, who is now manager of Derby County. "I say now to our players at Derby, work is more important than natural talent, work is more important than the decisions you make off the cuff everyday; work is more important than everything we see. "When work is at the core of what you do that’s what makes you or breaks you. I didn’t realise as a young boy I was blessed to have a dad and a mum who gave me the ethics to realise that work and what you do every day will become you, will be what you are." Lampard was also quick to pay tribute to Nordoff Robbins, having seen first-hand the impact that the charity’s specialist use of music has on the physical and emotional wellbeing of people with disabilities. "It means a lot to me personally to receive the Legends of Football award and to support Nordoff Robbins," he said. "It’s a fantastic collaboration and to be honoured alongside some great names of the past, but for me the most important thing tonight is to support Nordoff Robbins and the effect we can have on an evening with so many people joining in to raise funds for a great charity." The evening raised more than £500,000 taking the total Legends of Football has provided for Nordoff Robbins to £8m. 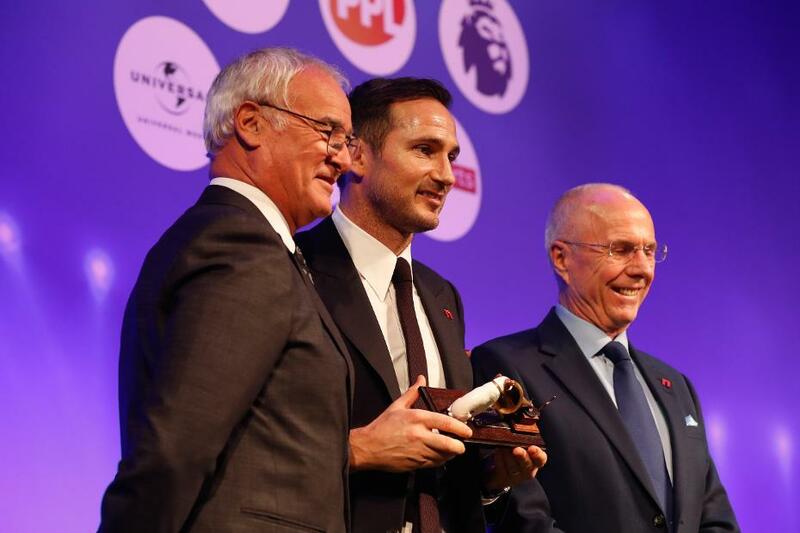 Lampard received his award from the man who brought him to Chelsea, Claudio Ranieri, and his manager at England, Sven-Goran Eriksson. "Legends of Football is always a great event, this year raising over £500,000 for Nordoff Robbins music therapy," said Premier League Executive Chairman Richard Scudamore. "The Premier League has proudly supported Nordoff Robbins for more than 10 years and the 2018 Legends of Football event celebrated the career of Frank Lampard. "The 1,000 people at the dinner heard many of Frank’s colleagues and managers commending him on his talent, professionalism and work ethic and Frank recounted football tales as well as his recent experience supporting Nordoff Robbins. A terrific night in aid of a very worthy charity."